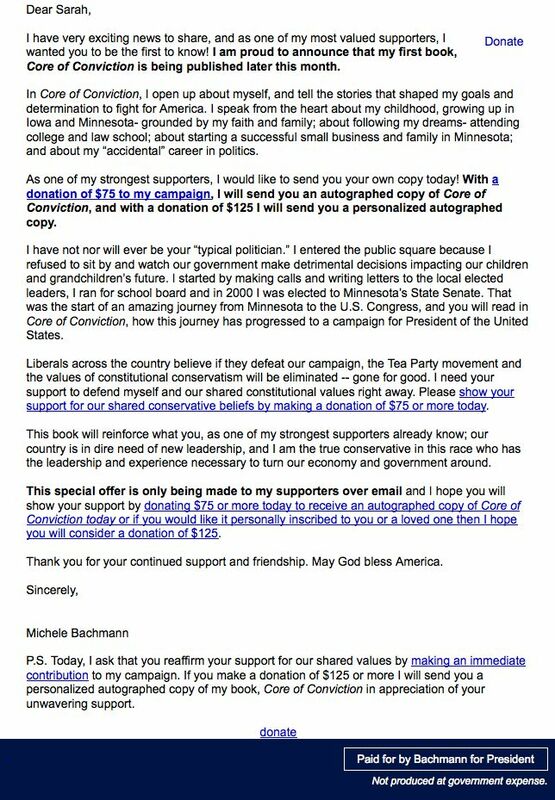 I was alerted to this fundraising letter by the people at the political blog Balloon Juice. In it, she (or, more likely, her staff) commit a variety of grammar and usage fouls. But the one that really sticks in my craw occurs not once, but twice. I myself am not positive what the technical term is for this offense. My reading of Grammar Girl points to a dangling participle or modifier. I don’t know for sure, as I am not a grammar expert. I usually can tell when something is wrong, but I don’t know a gerund from a predicate. I will leave it to pundits to determine whether her faulty command of grammar is behind her precipitous decline in the polls. In my world it would be, just as surely as Mitt Romney’s weird sense of humor must condemn him to also-ran status.